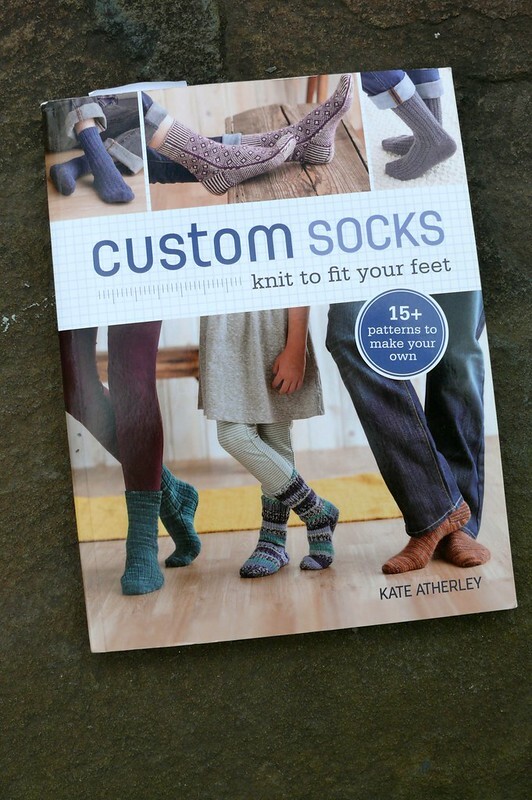 Custom Socks: Knit to Fit Your Feet by Kate Atherley (Amazon affiliate link here; Indiebound here) is by far the knitting book I’ve used most in my life. I asked for it for my birthday last year, so I’ve had it for just over a year, and I’ve used it to make six pairs of socks for other people (with a seventh pair on my needles right now). 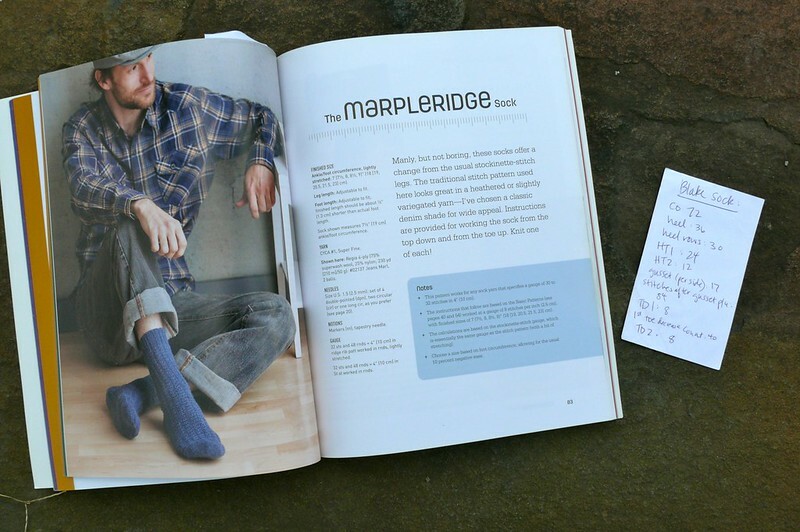 The book contains 14 patterns, including a basic toe-up sock, a top-down sock, and a ribbed sock. 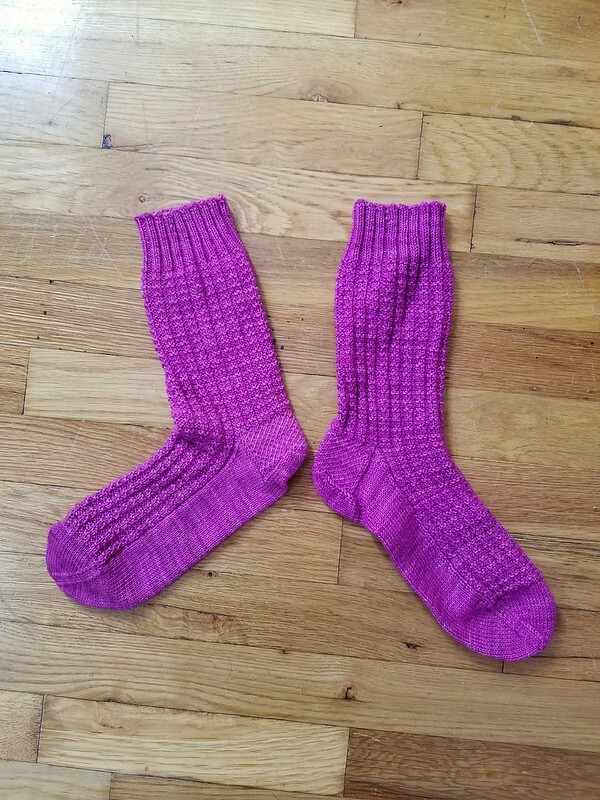 The not-so-basic sock patterns are all really lovely and cool, and Kate includes instructions for knitting each pattern both top-down and toe-up, so you can pick your favorite (or even knit one each way!). So far I’ve made the basic ribbed socks three times (in three different sizes, for three different people), the plain top down socks twice, and the Marpleridge socks once. I want to try each one of the other patterns in the book, but particularly Carpita, Harcourt, and Man of Aran. 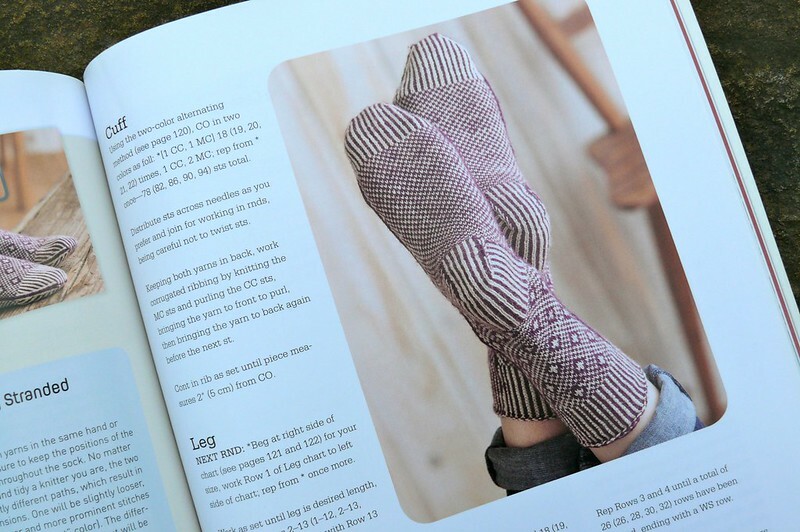 While I like the patterns in the book, its real genius is that it has really simplified making socks in any size with any yarn. 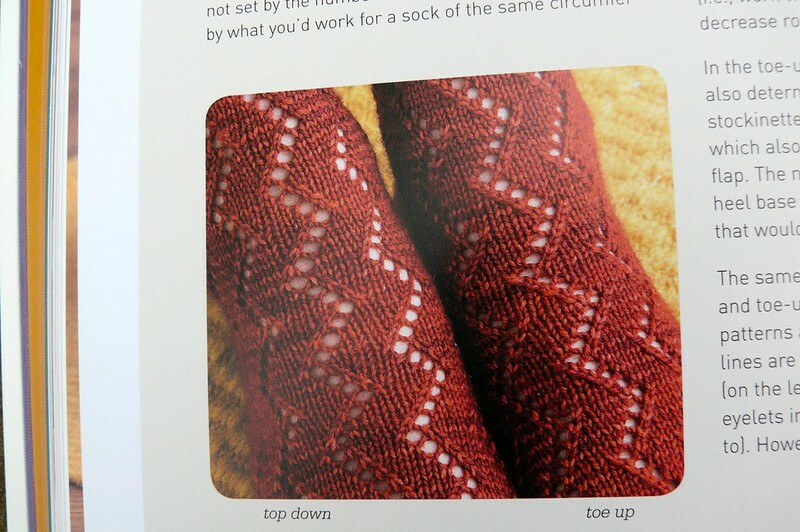 The book includes a BOATLOAD of charts that makes this easy- for example, if you know the finished circumference of the sock that you’d like to make, you can look up exactly how many stitches to cast on, how many heel stitches to separate out and how many heel rows to knit, how many stitches to for your heel turn and gussets, and the when and how many toe stitches to decrease depending on the gauge of your yarn. She includes crunches these numbers for sock circumferences from 5″ to 10.5″, at gauges from 4 stitches per inch to 9. Could you sit down and crunch these numbers yourself? Yes, maybe, and no, depending on how advanced your knitting skills are and how good at math you are. As a so-so knitter and a terrible mathematician, I am glad to be able to refer to the charts! You just jot down all the numbers that you need and plug them into the patterns in the book- it’s easy as can be! There are lots of tips for solving sock problems (ha! sock problems! are those really even problems?) that go way over my head, for example, how to do special heel flap decreases to keep your gusset stitches even when you’re knitting colorwork. I’m not sure if I would even know when to use this! But the nice thing about this book is that it offers lots to more advanced knitters, which is not something that every book can do. I also appreciate that Kate includes an entire chapter on fitting what she calls “non-average” feet. This is in-depth knowledge that isn’t easily available online, including things like what to do if your foot circumference is really different from your ankle/leg circumference, and how to account for things like diabetes and other special medical needs. This feels really inclusive and helpful– after all, isn’t it more likely that someone with “non-average” feet might be making their own socks? My favorite use for this book, though, is for gift giving. Kate includes charts that give the average foot and sock circumference, as well as the average foot and finished sock length, for each shoe size (men’s, women’s, and even children’s). 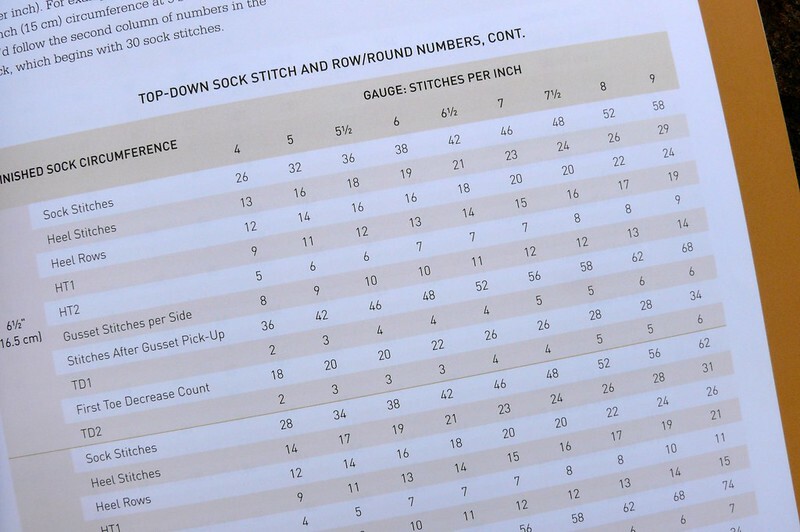 So I’ve been able to successfully make socks that fit really well for my dad, my sisters, my brother-in-law, my mom, and Blake, just by plugging their shoe sizes into the chart in this book. The first pair that I made using this technique was a pair of basic ribbed socks for my dad… I held my breath when he tried them on, but they fit like a glove sock! 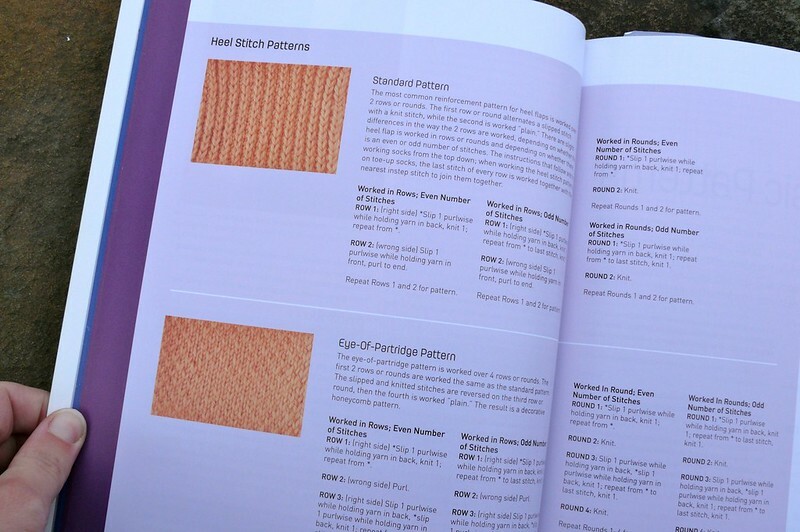 I’ve also used these charts to adapt other sock patterns for gift giving, too- I just altered the stitch and row counts that were included in whatever pattern I was using to match the numbers from the book. This is particularly helpful for simple patterns that only give you one size and just say “knit to desired length” or something like that. I haven’t had a pair not fit the recipient really well yet! All in all, I love this book, if that isn’t clear, and think it would be a great addition to your personal or neighborhood library. It’s made me much more confident that the socks I knit for other people will fit, and as a result, be worn! Now, tell me, are you doing any holiday knitting? What do you like to knit for other people? 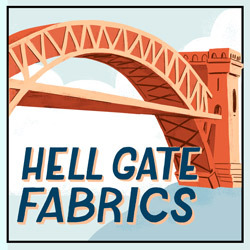 Any favorite items or patterns? Do tell!